Is This The World's Best Investment? If someone urged you to buy a stock that could appreciate in value by 1,000% or more in less than 10 days, you'd say, "Thanks, Bernie Madoff. Aren't you supposed to be in jail?" Yet, there is an investment that can pay you pack $10 or more for every $1 you invest, often in as little as 10 days. It's entirely legal, ethical, and you can limit any losses by starting small and rolling out big later. It's marketing to your own clients. The screen capture above shows part of an email promotion that pulled in $10.52 for every $1 my client paid me to write it. Why does marketing to your clients work so well? Think about it: There's no easier sale to make than to people who have bought before. Your current clients know you, so you're not a stranger. So ... if you want to get in on the safe, legal investment that can pay you back 1,000%, or more, start marketing better and more often to your current clients. It's a brilliant example of Funnel Vision, a concept I learned from Jay Abraham. Funnel Vision (the opposite of tunnel vision) simply means looking outside your industry for new ideas. Because, really, there are no new ideas -- only new combinations of old ideas. 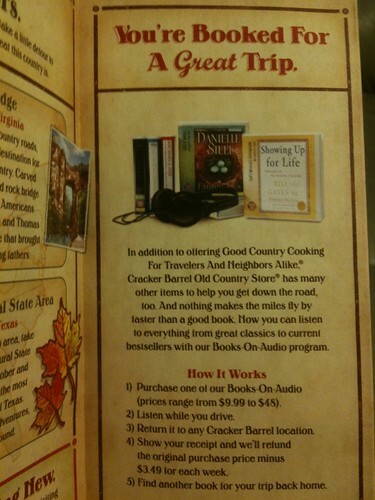 ... so when Cracker Barrel borrowed audiobook lending from libraries, they are working in this fine tradition. another reason to visit their restaurants -- to return the audiobook. Of course, McDonald's did something similar in 2006 when they introduced DVD rentals in their restaurants. That just means there's plenty of room to be creative and borrow ideas from other industries to better serve your clients. Now. What idea will you borrow this week? Hands up -- who loves networking to find new clients? Networking (as most people do it) forces you to talk to strangers and ask for help, two things most of us hate to do. But why do what most people do? That would just make you average. Instead, keep your eyes peeled for new ways of doing old things, like networking. Example: an article in The Wall Street Journal has advice on dating you can use when networking. After Lisa Jenkins, 42, a Clarkston, Wash., marketing consultant, got divorced several years ago, she came up with a method she calls "reverse stalking." Once or twice a week, she frequented places she found interesting—bookstores, art galleries, a bistro, a charity—at about the same time of day. "People who might be interested in you know where to find you when they finally get up the courage to ask you out," she says. While volunteering on a fund-raiser for a local college art center, she met another volunteer, who asked her to lunch. Three years later, they are engaged. "I am very glad I didn't leave it to chance," Ms. Jenkins says. By appearing regularly where she might find single men with the same interests as her, she met her ideal match. Questions: Where do your ideal prospects hang out? And how can you start appearing there regularly? Example: If your ideal client is educated and earning over $100,000 per year, where would they hang out? Try your college alumni club -- wealthy, successful people often take leadership positions in such organizations. Volunteer for a project, appear regularly to help out, and you may find some new business. At the very least, "reverse stalking" as a volunteer will raise your profile while helping others. Win-win. Thank-You Marketing: Ice Breaker and Deal Maker? I spoke by phone yesterday with a prospect about giving a marketing presentation to his sales force. 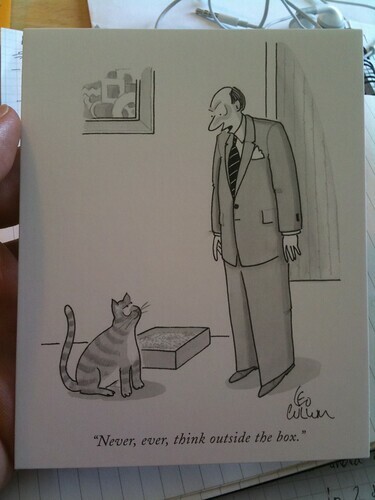 When I called, he said, "I've got your thank-you card here on my desk!" Ice broken. Smooth sailing. And we set a date in May for me to speak to his group. Did my humorous, pre-call thank-you note make the sale? No. I had to research my prospect, offer a solution that met his needs, and ask him to book me as a speaker. Did my humorous, pre-call thank-you note make the prospect smile? Yes. And by making him smile -- laugh, even -- before our phone call, I ensured that he would be in a good mood and receptive to my message. Which paved the way for a sale. FYI: You can buy these cards here. Let's look at that second option. Because when you promote your business better, you turn more prospects into clients with the same time and money you’re already spending. Which is a good thing. 1) Stop writing web pages. Start writing sales pages. It may not be 1996, but most web sites are still brochureware. And that won't cut it. Instead, write or rewrite the pages on your web site, to create sales pages. Your goal? Compel more people to order or contact you for an appointment. Tip: Unless you’re making a specific offer to visitors and telling them to click the order button or pick up the phone and call you, your web site is under-performing. Another tip: Use an analytics program, like Google Website Optimizer, to continually improve your web pages, by testing two or more versions against each other to determine a winner. Then test again. And again. Never stop testing and you'll never stop improving your conversions. 2) Stop ignoring prospects. Start following up with them. Do this: Write a 3-part series of follow-up emails or letters and send them to every qualified prospect who contacts your business. I've never seen this NOT increase sales for a small business -- often by 50% or more. Because people are busier than ever. So, when you touch prospects at least 3 times with a message that they want to hear, they will listen to you, put a higher value on you than your competitors, and buy from you more often. Writing sales letters and follow-up campaigns are two of the ways I make more money for my clients, but you can try this yourself, if you're willing to invest the time and effort to master marketing. Here's a neat trick, courtesy of Green Horizons, the company that cuts my grass every week. Green Horizons knows that, if their clients are too busy to cut their lawn, they're probably too busy to wash windows and clean toilets, as well. So Green Horizons partnered with two other companies -- Squeegee Bob's and Cleaning Patrol (cool names!) -- to offer those services at a discount to their own clients. And Green Horizons knows that the best time to cross-sell additional, related services is when your client has their wallet out. So they make this offer right on the order form. ... up to and including the services and products of strategic partners you trust. Whether or not you negotiate a revenue-sharing deal with partners is up to you. Look at it this way: Somebody is going to get that revenue for those extra services and products. It might as well be you. 1) Look at your order form. Does it offer additional products or services to help your clients? If not, add one upsell this week. Today would be better. 2) Look at your clients. Are they a perfect match for additional products or services that you can provide? Example: clients of a lawn care firm are natural fits house cleaning, window cleaning, errand running, nannying, tutoring, dog walking, etc. Make a list. Then, start giving your clients more of what they need, either from your own company or from a strategic partner's. What's your secret for creating great work? I figure it took 20+ hours over the last 11 years for me find and write down each of these classic headlines. I call it EIEO -- excellence in, excellence out. When you prime the pump with the best advertising headlines ever written, some pretty good headlines are likely to come out. 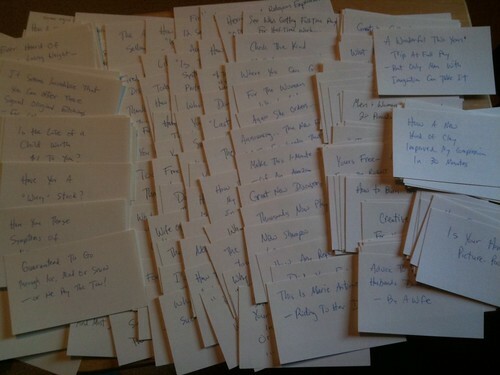 Yes, it was a royal pain in the posterior to write down all these headlines on 3x5 cards. And yes it's a pain to spend 15-20 minutes combing through every single one of them in search of the 2 or 3 gems that might be relevant to the project at hand. But genius is the art of taking pains. No pain, no genius. And there's no shame in building on the best ideas of others. In fact, you're a fool not to. Isaac Newton wrote to a rival in 1676: "What Descartes did was a good step. You have added much several ways, and especially in taking the colours of thin plates into philosophical consideration. If I have seen a little further it is by standing on the shoulders of Giants." Mom and Dad told you how important it is to say "Thank you" in life. And it may be even more important in business. In a world where your prospects and clients are bombarded with hundreds of marketing messages daily, the simple act of saying "Thank you" in a note can help your business stand out and get noticed in three ways. Yes, it can be bothersome to spend 20-30 minutes writing and mailing 3-5 thank-you notes to all the important people you talked to each day. But you know what's more bothersome? Explaining to your family why you're having hot dogs and beans for dinner again tonight. Sales Obermeister Tom Hopkins has said that, if someone is a client or prospect of his, they will hear from him at least 6 times a year (in person, by mail, or by phone) with information that they find valuable. How often do you follow up with prospects and, more importantly, with clients? If your answer is "0" or "I don't know," here's an exercise -- write down last year's revenue for your small business. That's about how much you could have earned if you had followed up at least 3 times with prospects (before the sale) and clients (after the sale), based on my experience doing it since 1998. Lesson: Don't launch any marketing effort that doesn't have follow-up communications built into it. Don't run an ad -- online or in print -- if you can't commit to following up at least 3 times with prospects who call your office, for example. If you fail to follow up, you leave at least 50% of your cash on the table. So, in a nutshell, the bad news: If you ignore your prospects, they will ignore you. The good news? If you pay attention to your prospects, they will pay you. To learn more, check out the guide I created on Followup Marketing. Instead of saying, "I'm a portrait artist, specializing in caricatures," she said: "A great way to use me is at parties, corporate events, or to attract a crowd at your trade show booth when I draw pictures of people." Would any of those interest you? I am so grateful you came into our lives. I have been thinking of how our business has changed for the better and here are my thoughts ..
You wrote our “20-year anniversary” sales letter of appreciation -- this resulted in 50+ service calls. Nothing could be finer!!! Takeaway #1: How often do you send special offers to inactive clients -- people who haven't bought from you recently? If you can't remember the last time, it may be time to send them a "client reactivation" letter, like the one I wrote that delivered 50+ phone calls. If it costs you $100 to acquire a client and you have 250 clients who haven't bought from you in 6-12 months, you're sitting on an inactive client list worth $25,000. You owe it to yourself to recoup some of that "sunk cost" by marketing to them again. You helped us develop a sales script. Priceless! My conversion rate on price-shopping Dex callers has improved significantly. You showed me how to promote our special features -- attentiveness, humor, no-surprise pricing, no fee to diagnose, rock star technician, Angie’s List awards, etc. -- and make the customer call me back, most often humbly, because no better deal or promise of honest, competent service could be found! Takeaway #2: Do you have a sales script? It includes a list of the most-common questions you get from prospects, and your best answers. If not, I can write one for you, in your own words. A good sales script can boost your revenue faster than almost anything else. Because, when you always say the right thing, you convert more prospects into paying clients. We added a late-night/weekend surcharge at your recommendation. We had 4 service calls yesterday, 3 of them after 7 pm. The extra bling from OT is most appreciated. Thank you for making us take a hard look at our fees. An increase was long overdue! Takeaway #3: When was the last time you raised your prices? You may be surprised that nobody notices but you. Especially if you really extend yourself with late-night or rush service. The only way to find out is to test higher prices for a few days or weeks. (Note: I don't charge to consult on pricing strategy -- it's part of every project I do for people who use me to expand their business with my copywriting services). You constantly call us or email information that may help out. You are a pit bull advocate for your clients and don't ignore us once the check is cashed! You stick like glue and keep us on our A game. I can't thank you enough for sharing and stressing the simple strategies that REALLY WORK yet maintain the integrity and personality of our business!!! The only thing I can say to that is, THANK YOU, Kathleen. At a networking event two days ago, one business owner did something very smart. Instead of telling the group what she did, she told us how to use her. Wow. Heads began nodding in agreement among the roomful of potential clients for her service. Unlike, say, mimes or clowns, nobody doesn't like caricature artists. Think of it: While everyone else is handing out pamphlets or brochures at a trade show ... you could be handing out personalized portraits, drawn while prospects wait in line (where you have a chance to chat them up and soft-sell your company). Now. What other uses can you see for this "Tell me how to use you" style of networking pitch? ... you could say, "A good way to use me is to free up your time and energy for money-making activities while I take care of reconciling your daily receipts and other drudgery" (YAY). ... cut to the chase. Tell people exactly how to use you, what it looks like, and the benefits they'll enjoy by doing so. The easier you make it for people to see the benefits of using your service, they faster they will buy your service. A friend of mine just lost his five-month-old son, Max, to liver cancer. And that reminded me of the saying, "God is First, Family is Second, I am Third." Business ranks, at most, #4. Sometimes we forget that. Not today. I don’t know how to express my sadness at Max’s passing. I prayed daily for his recovery, and now I pray for his mom and dad. Without ever meeting him, little Max brought tremendous meaning to hundreds, maybe thousands, of people through his parents' networks of friends, family, co-workers, and neighbors. Those of us who are parents will hug our children a little longer tonight, be a little more eager to help with homework, and tell them one extra time how much we love them -- because of Max. Max’s short life brought all who know his parents closer together. And Max made a lot of parents a little bit better at doing their job, the most-important work on earth. Yesterday, I delivered a marketing presentation to the Independent Community Bankers of Minnesota, as a guest of their quarterly Marketing Council meeting in Eagan, MN. My presentation, "5 Ways to Grow Your Banking Business," featured the idea of "capturing and cloning" your best clients. Then what? Capture and clone their words. That means you write a short script based on what your top-referring clients are saying when they recommend your business to others. Then, train your other clients to use that same, proven script. Stop trying to reinvent the wheel. If your best clients are already referring you, find out what they're saying, and train the rest of your clients to say the same thing. If you handle the marketing for a small business, here's a sales tip: It takes 5. Specifically, 80% of sales come after 5 or more contacts with prospects, according to most of what I've read and experienced in business since 1996. So, if you contact a prospect 4 times or less, you are leaving 80% of your revenue on the table. One of the simplest, cost effective and smartest ways to stay in touch with customers, key prospects, and referral partners is to create and use an eletter in your marketing efforts. If it’s done consistently, you’ll have an incredibly powerful database built up that you can communicate with on a regular basis. We use ConstantContact for simplicity and cost and it has been wonderful. We shoot to get an eletter our every two-weeks and it always generates interest, business and comments each time we send it out. A special client appreciation event is a very smart marketing strategy to engage, educate, update and thank top customers, referral partners and key prospects. People love to network, have fun and learn more. It’s also a great way to meet prospects in a fun, relaxed setting where your best customers are speaking highly of what you’ve done to help or improve their life. Which white circle is bigger, the one on the left or the one on the right? ... the two circles are identical, but they appear to be different sizes because our brains automatically compare each of the circles to their surroundings. The left circle is surrounded by small circles and so, in comparison, appears to be relatively large. In contrast, the right circle is surrounded by large circles and therefore appears to be relatively small. Now. What does this have to do with your business? This: If you're having trouble getting noticed by prospects, it may be because you don't appear large enough to get their attention. When you compete in a huge market, you can't help but look small much of the time. By contrast, in a smaller, niche market, you will look larger and more impressive. Best part: It's faster and less expensive to mail, meet, call, or visit your prospects in a small market than in an enormous one. And if the results don't pan out, you can always pick a new niche market. You're looking at a clever little lid-top ad from Caribou Coffee, which I snapped a picture of this morning. It hits me at the happiest moment, before I've had my first sip of java, and offers a discount on more java. It uses previously wasted real estate to deliver a marketing message to 100% of intended recipients ... for pennies to print and zero postage. The offer combines two swell ideas, chocolate and happy hour, to form a new one: Chocolate Happy Hour ... for 3 bucks. What's not to love? Offering a special price to people who already like Caribou -- their current customers -- is a profitable way to get more people back in the store at the otherwise-slow time of 3-6 p.m. This kind of "bounceback" offer ought to be in every marketer's tool box. Now. 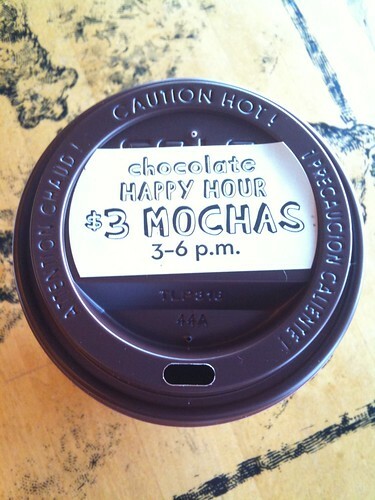 How can you adapt Caribou's Chocolate Happy Hour promotion to your business?